The 2010 Convention will be held at the newly renovated Hyatt Regency St. Louis at The Arch, situated in the central part of downtown St. Louis and adjacent to the Gateway Arch that stands at the confluence of the Mississippi and Missouri rivers. The view is spectacular. 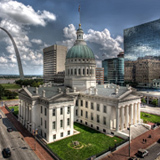 The hotel is within walking distance of the Gateway Arch Riverboats (for sightseeing cruises) and the MetroLink, the region’s light rail system, so you can visit some of the city’s points of interest including the Eugene Field House and—Toy Museum, St. Louis Walk of Fame, City Museum, Science Center, Anheuser-Busch Brewery, Old Courthouse, St. Louis Mercantile Library, and many other attractions. 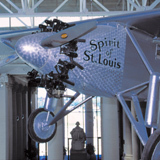 There’s so much to see and do in St. Louis, we thought we’d start you out with a few “must-see options” courtesy of the St. Louis Convention & Visitors Commission. Ride to the top of the Gateway Arch, towering 630-feet over the Mississippi River. Follow the footsteps of explorers Lewis & Clark at various historic attractions. Explore Forest Park’s 1,300 acres of lakes, walking paths, and attractions. Drive Old Route 66 and visit some of the “Mother Road’s” most fascinating stops. Enjoy world-class free attractions, including the Art Museum, Zoo, Science Center, Anheuser-Busch Brewery, Grant’s Farm, and the Missouri History Museum. Marvel at the Missouri Botanical Garden, one of the world’s top public gardens. Free your inner child at the Magic House, City Museum, and other kid-friendly attractions. Visit an ancient Indian civilization at Cahokia Mounds. Cheer for the MLB’s Cardinals, NFL’s Rams, and NHL’s Blues. Count the mosaics at the breathtakingly beautiful Cathedral Basilica of Saint Louis. Flirt with Lady Luck at one of the area’s six casinos. Experience live blues music in one of the dozens of area clubs and taverns. Get your motor running at the Museum of Transportation or Gateway International Raceway. 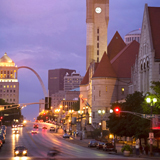 Visit the heart of St. Louis through our friendly and charming neighborhoods. Take in the art at Laumeier Sculpture Park, the Contemporary Art Museum, and the Pulitzer Foundation for the Arts. Re-discover your heritage at the Old Courthouse, Black World History Museum, and Faust Historic Village. Visit the world-famous Budweiser Clydesdales at the Anheuser-Busch Brewery. Satisfy your taste buds at any of our hundreds of one-of-a-kind restaurants. Fill an extra suitcase during a shopping trip through major malls and antique and collectible stores. Attend one of the area’s unique fairs or festivals. 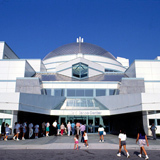 Explore the final frontier at the Science Center’s Space Sciences Center or the Challenger Learning Center. Get an adrenaline rush on the world-class roller coasters and thrill rides at Six Flags St. Louis. Play Scott Joplin’s ragtime tunes at the composer’s historic home. Talk to the animals at Purina Farms, the Wild Canid Survival Center, the World Bird Sanctuary, and the St. Louis Zoo. Cruise the mighty Mississippi River on the Tom Sawyer or Becky Thatcher paddle wheeler.